2. In a pan heat a tbsp. of oil and saute the onions until they are pink and translucent.Add just 2 pinches of salt. 3. Add the fried karelas and mix. Sprinkle a little water and simmer for 2-3 minutes. Serve with plain rotis. looks so inviting !! Thanks for linking to the event !! Appreciate it !! 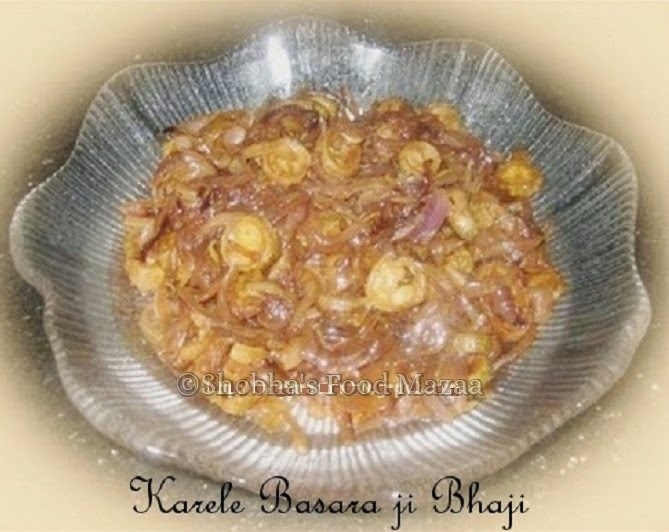 Healthy and tasty Karele subji.. The overnight marination removes the bitterness.. Sindhi recipes are simple yet amazing.. Thanks Sujitha.. specially this one has no spices at all and surprisingly it tastes so good. This is new to me... Looks so simple and tasty. Will try !